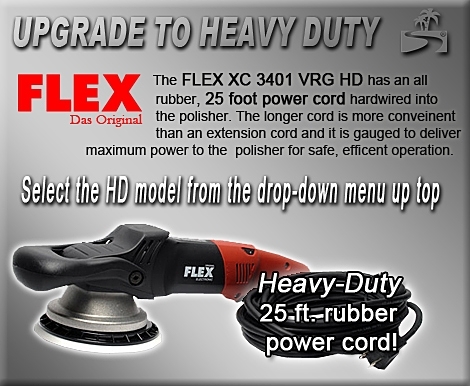 FLEX XC3401 VRG Orbital Polisher Intro Kit - Choose Your Pads! The FLEX XC3401 VRG Orbital Polisher Intro Kit makes it simple to get exactly the pads you need for your detailing job. Choose any three from Lake Country's long list of premium pads. We'll throw in the FLEX Polisher Bag to help you carry and store your new FLEX kit. All this is yours at more than $90 off the regular retail price! The orbital rotation of the FLEX Polisher simulates the circular movement of the human hand while polishing. This motion is less likely to cause holograms than a rotary buffer. At the same time, the polisher's highly smooth running facilitates a careful, precise finish and allows for hologram-free polishing. The positive drive ensures a uniform movement, even under load, thanks to constant lift. Taken in conjunction with the large stroke length the FLEX can remove existing holograms from black finishes. The large stroke length refers to the size of the orbit. On many dual action polishers, this is a very small distance and therefore you feel a jiggling motion. On the FLEX polisher, the stroke length is 8 mm, a huge distance in terms of orbital polishers! The FLEX Dual-Action Polisher has a true dual action motion that reduces vibration. The FLEX Orbital Polisher�s smooth acceleration and uniform, controlled motion make this DA machine ideal for novices and pros alike. The FLEX XC3401 dual action polisher comes with a 5.5 Inch Hook & Loop Backing Plate and a 1 year manufacturer warranty. BLACKFIRE Advanced Pad Cleaner prolongs the usefulness of your buffing pads by removing product residues. When pads are cleaned thoroughly after every use, they maintain their texture and performance far longer. You'll save money and you'll get better results with your existing pads. Use Blackfire Advanced Pad Cleaner to clean foam and wool pads after every detail. BLACKFIRE Advanced Pad Conditioner makes machine detailing easier by reducing friction between the pad and the paint. Products glide on more smoothly and the paint is protected from dry buffing. BLACKFIRE Advanced Pad Conditioner reduces skipping or sticking of the pad. Use it every time to prime your pads for perfection. The FLEX Polisher Bag stores your FLEX polisher, pads, and towels! Carry your buffer from job to job in this ruggedly constructed storage bag. Interior pockets and a large capacity make this bag perfect for storage and transport of all your detailing supplies. The FLEX Polisher Bag is made of tough canvas with reinforced seams and an extra large zippered opening. The bag features an adjustable strap and the FLEX logo printed on the exterior. PLUS - Choose 3 of the following pads! Each CCS Pad measures 7/8" of an inch thick, perfect for even distribution of heat and product. The CCS Pad's tapered edge was designed to optimize performance, regardless of the type of machine used. These CCS Smart Pads 5.5 inch Professional Foam Pads give you maximum maneuverability on your dual action polisher. Large foam pads tend to bog down DA polishers. That�s why 6.5 inch pads are the recommended size, but we�ve streamlined the dual action buffing pad even more with the CCS Smart Pads� Dual Action 5.5 inch Professional Foam Pads. These compact pads give the dual orbiting head even greater freedom of motion to help you work efficiently and effectively. The CCS 5.5 inch Foam Pads are also a perfect fit on orbital air sanders with a 5 inch backing plate. Each CCS pad features VELCRO brand hook and loop fasteners covering the entire back of each pad to secure to a hook and loop backing plate. We recommend the 5 inch Flexible DA Backing Plate. The Lake Country CCS Pads feature a "Simple 6" idea. This easy to understand system keeps your pad colors and uses consistent throughout the CCS and Flat Lake Country Pads. Yellow Low Profile Cutting 5.5 inch Foam Pad - Use this pad to apply compounds or polishes to remove severe oxidation, swirls, and scratches. It is the most aggressive and should only be used on oxidized and older finishes. Always follow this pad with an orange or white pad and a fine polish to refine the paint until it is smooth. Orange Low Profile Light Cutting 5.5 inch Foam Pad - Firm, high density foam for scratch and defect removal. Use this pad with polishes and swirl removers. It�s an all around pad that will work on most light to moderate imperfections. White Low Profile Heavy Polishing 5.5 inch Foam Pad - Less dense foam formula for the application of waxes, micro-fine polishes and sealants. This pad has very light cutting power so its perfect for pre-wax cleaners. Green Low Profile Polishing/Finishing 5.5 inch Foam Pad - Use this foam to apply one-step cleaner waxes. It is a balance of polishing and finishing that is perfect for all-in-one product application. 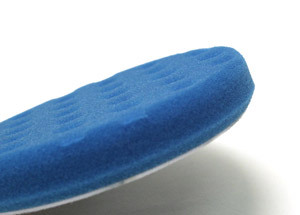 Blue Low Profile Light Polishing 5.5 inch Foam Pad � This pad is not as dense as the green polishing pad and provides little cutting ability. Generally used to polish to perfect, this pad will leave a high shine on the surface. Perfect for use with a finishing glaze, last-step polish, and some all-in-one cleaner polishes. Black Low Profile Finishing 5.5 inch Foam Pad - Composition is firm enough to withstand added pressure during final finishing to remove buffer swirls. It has no cut and will apply thin, even coats of waxes, sealants, and glazes. 3 Lake Country CCS Pads of Your Choice! A total retail value of $508.93. Save $88.94! Grit Guard Universal Pad Washer Free Bonus! FLEX XFE 7-12 3" Mini Polisher - FREE SHIPPING!